Clickety clack, clickety clack – that’s usually the sound of the shopping cart I select every time I shop. Don’t know why I always get that one cart that wobbles and clicks with every rotation of the bumpy wheels. It is a very irritating and distracting noise and people look at you funny when you continue to utilize the thing rather than selecting another. If there’s a crowd behind you waiting for a cart, you tend to seize the first one and get on with your foray into the wonderful world of Wal-Mart. Generally, I try each cart until I find a nice, quiet one, wipe off the handles with the anti-bacterial sheets provided and begin my adventure. A few days ago I found myself at the usual “get a quiet cart” frame of mind as I entered the hallowed halls of Wal-Mart. Barring the cart line was a small number of residents from the local group home – I love those people and make it a point to speak to them. One gentleman pulled out a cart for me and smiled, “I will pull out your cart – here lady I got your cart for you!” I smiled and thanked him and began my journey. 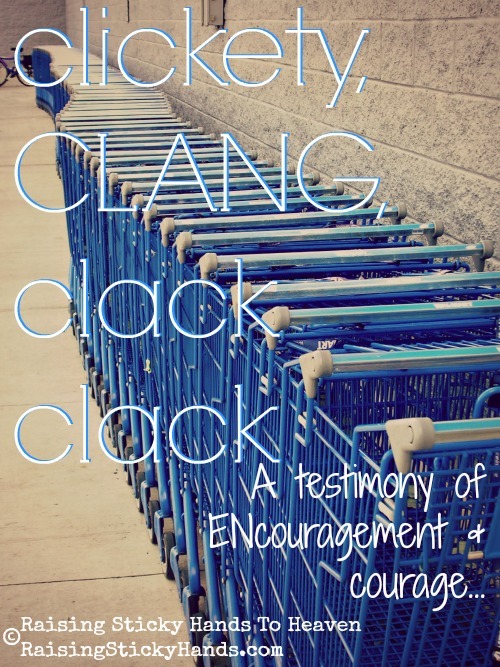 Not only did the cart sound clickety clack so that people stared – it made a clickety, CLANG, clack clack. Loudest cart I ever did hear in my life – it should have been retired. And – not only that – it was rolling crooked at a slight angle. About ten feet away from the generous, kind little gentleman, I decided to return the cart and get another. However, an afterthought came through loud and clear! I replied to me, “No he won’t. Keep this cart. He will consider it a rebuke. Keep the cart.” I kept the cart. With every amused stare from the general public, I stood up straight and tall, held my head high and smiled sweetly knowing a sweet little guy from the group home felt good about giving his shopping cart away. I also sensed a little nudge of ENcouragement from the Lord that gave enough courage to endure the remainder of my loud, clickety, CLANG, clack, clack, sidewinder cart adventure. Jesus probably had a little laugh about this one.